Last year, DC Entertainment’s offerings were the main draw at Comic-Con, with their major push for the panned Batman v. Superman leading the charge. But this year, Marvel’s plethora of offerings are a comic book fan’s dream. The most exciting trailers came straight from Marvel’s partnership with Netflix. The streaming service has quickly become a force to be reckoned with in the realm of original content, heavily due to the critically-acclaimed Marvel character-based content they produce. And one series many are looking forward to is Luke Cage. 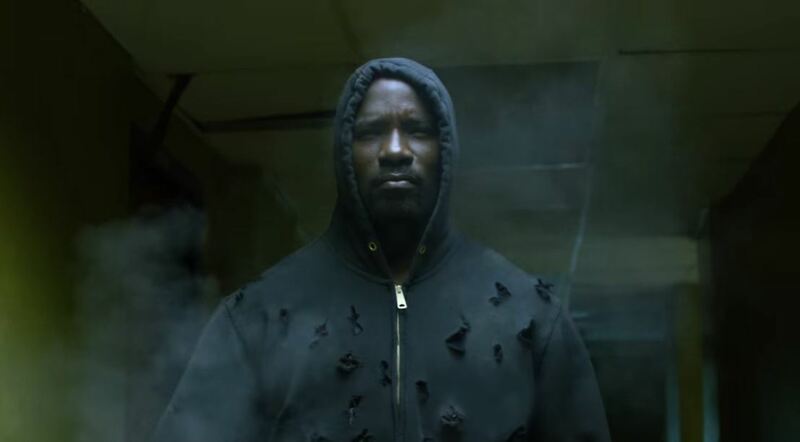 First appearing in the Emmy-nominated Jessica Jones, Luke Cage is a black superhero based out of Harlem with super strength and bulletproof skin. Mike Coulter stars as the street-level hero, with all of Season One’s episodes debuting on September 30. Comic-Con also saw the first official footage for the new forthcoming Iron Fist series. The martial arts based series, which centers around a white man trained the art of kung-fu, is sourced from another popular long-term comic book series. The combination of Luke Cage and Iron Fist has been one of the most memorable and long-standing partnerships in comic book history. And like Luke Cage, Iron Fist was created in a time where racism was prevalent in comics. Look for Marvel and Netflix to honor the source material while also making a deliberate attempt to side-step its racist history. The first Marvel show to debut on Netflix officially announced its third season at The Con. Daredevil, starring Charlie Cox, was an immediate critical darling and fanboy favorite in its first season. And in season 2, the additions of Elektra and The Punisher took the series to the next level while also serving as a jumping board for the now forthcoming Punisher series. With the third season, expect to see at least one more iconic Daredevil foe appear, like Bullseye. With all of these street-level heroes running around New York, they are bound to run into one another at some point, right? We already saw Luke Cage show up in Jessica Jones, and it’s only a matter of time before more heroes cross paths. And in the now official series The Defenders we’ll get to see Daredevil, Jessica Jones, Luke Cage, and Iron Fist collaborate to fight for the citizens of New York. There’s no full trailer yet, but Netflix did drop a teaser video narrated by Daredevil’s teacher Stick (played by Scott Glenn). For Marvel’s Agents of S.H.I.E.L.D., news that was lightly teased weeks ago was confirmed. Ghost Rider is coming to the series. Many fans were hoping that this iconic character would show up at Netflix first, but as the larger Marvel Cinematic Universe starts to dabble with magic with the impending movie Doctor Strange, it was only a matter of time before it seeped its way into the movies’ stepchild S.H.I.E.L.D. The series has been heavily focused on the Inhumans over the past two seasons, so it’ll be interesting to see how they handle a man with a flaming skull, magical chain, and mystical muscle car. Lastly, we already knew that Black Panther was going to be the blackest comic book movie ever, but with the new actors confirmed for the film, Marvel is leaving no doubt of that fact. Michael B. Jordan (who will play the villain), Danai Gurira, and Lupita Nyong’o are all confirmed cast members for the film. With Chadwick Boseman as the titular African king/hero and Ryan Coogler in the director’s chair, prepare for the awe-striking blackness set to storm theaters in 2017. And if that wasn’t enough to whet your palate, a new Captain America: Civil War featurette highlighting Black Panther’s character in the movie has also been released. Watch that video below.